Planning to watch Firangi, featuring ace comedian Kapil Sharma and Ishita Dutta, read here full movie review before booking your tickets. The story of the film is based in pre-independent India and revolves around two neighbouring villages. Manga (Kapil Sharma) is a young village boy whom British officer Mark Daniel hires for doing menial work. When he meets Sargi (Ishita Dutta) at his best friend’s wedding in a neighbouring village, he falls in love with her and decides to marry the girl. However, when he sends his family to meet Sargi's parents for fixing their marriage, Sargi’s grandfather, who is a staunch follower of Gandhiji and his ideology, turns down the marriage proposal saying that he cannot marry his daughter with a man who works for the British. On the other hand, Mark Daniel and king Indraveer Singh plan to set up a liquor factory in Sargi’s village and hence they want everyone to vacate the place. When villagers refuse to vacate the village, Indraveer invites villagers to his palace, offers them alcohol and when they lose their control over themselves, takes their thumb impression on a legal document which states that the villagers have sold their money to the king. The whole village blames it on Manga because it was he who had convinced everyone to come to king’s palace. Manga was totally unaware of Indraveer and Daniel’s secret plan. But once he comes to know about their evil plan, he vows to steal legal papers from king’s palace and return the same to the villagers. Will he succeed? Will he ever be able to marry Sargi? To know watch the film. Firangi stars ace comedian Kapil Sharma in the lead role. The film heavily relies on his shoulder and also the fame he has earned over the years as country’s most popular comedian. Kapil made his movie debut with Abbas Mustan’s Kis Kisko Pyaar Karoon which was a box office success. While his debut film was an out-and-out comedy and worked because of its high fun quotient, Firangi has many more emotional dimensions. Kapil tries to pull off his character well. He succeeds in certain parts, he fails in others. But since we have accustomed ourselves so much to his craft as a comedian, we don't mind paying less attention to areas where Kapil as an actor falters. His performance could have been more nuanced and refined. Ishita Dutta, on the other hand, plays her part well. Despite getting limited screen time, she makes most of the opportunity and leaves a mark. She was very much in her character. Actor Inaamulhaq as Kapil Sharma's friend is decent. Other actors in the supporting cast are okay. Director Rajiev has beautifully meshed storytelling and pre-independent era into his film. However, the main problem with the film remains its flawed story. Had the writers worked a little extra on the story and also its screenplay, Firangi would have turned out to be a much better film. The director had Kapil Sharma as the leading man. He doesn't succeed in taking the best out of the actor. The film is not executed well. Having said that, Firangi is enjoyable and entertaining despite its various flaws. Firangi is set in pre-independent India, which clearly means that it would have not been an easy process for the makers, in such kind of films, maintaining authenticity is crucial. Firangi has been shot on both sets and real locations. The artwork of the film is really good. Sets are believable and costumes gel well with the period Firangi belongs to. Talking about other technical aspects, the editing of the film could have been better. The film could have been trimmed to a shorter length. It becomes snail paced towards the end. The soundtrack of Firangi is extremely situational. Makers have made no efforts to promote the music of the film, which should have not been the case as the album has some really good numbers. The film has five songs in total. The first song ‘Oye Firangi’ is good and goes well with the mood of the film. Sunidhi Chauhan’s powerful voice makes this song likable. With traditional folk appeal, the second song ‘Sajna Sohne Jiha’ is decent. 'Sahiba Russ Gayiya' by Rahat Fateh Ali Khan is brilliant. The next song Gulbadan is avoidable. The last song in the album is ‘Tu Jit Jawna’ by Mamta Sharma is also good. If you are a Kapil Sharma fan, you are not going to miss his film anyway. And if you are not very fond of the comedian and his craft, you can watch it at least once. 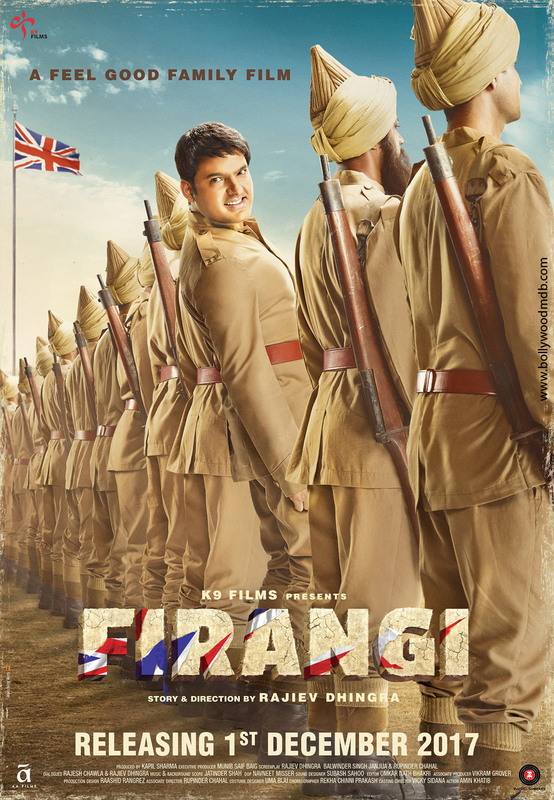 Firangi is a sweet, fun and well worth a watch for any film lover who does not very particular about logic in a movie. Salman Khan and Jacqueline wrap up Mumbai schedule of ‘Race 3’!